With the Torchwood premiere dates rapidly approaching it isn't suprising that there has been a lot of media interest in the show's return. Broadcast dates are now confirmed for the UK and Canada, with a previews having taken place in London and Swansea in the UK, and many across the States a couple of days before it premieres there, plus the cast and crew at the SDCC that weekend. Web Of Lies has now been formally announced as tie-in application for iOS devices. Monsters and Critics(30th) - SFP-NOW Blurb Podcast Alert: Arlene Tur! Torchwood: Miracle Day! Woo! Den of Geek(23rd) - Russell T Davies interview: Torchwood, Miracle Day, Children Of Earth, and a Torchwood movie? Hollywood Reporter(28th) - 'Torchwood: Miracle Day': U.K. Fans Not Happy About Delayed Premiere; Will it Affect Ratings? Guardian(28th) - Torchwood: Miracle Day – why must UK fans wait a week for the new series? Den of Geek(23rd) - Torchwood: Miracle Day UK transmission now at least a week after US premiere? Anglotopia(23rd) - Torchwood: Starz Releases Plot Summaries for first 7 Episodes of Miracle Day – SPOILERS!! Russell T Davies discusses making Torchwood for UK and US TV. This is available to listen to worldwide via the BBC website. Composer Dominic Glynn was the guest on this show, chatting about his music and playing extracts from various works including Doctor Who. Alex Kingston talks about her play Luise Miller and on being River Song in Doctor Who. This is available to watch in the UK via the BBC website (27:00) until 5th July. Phone-in and discussion of Karen Gillan from the recent paper reports. This is available to watch in the UK via the ITV Player (03:02, 11:38, 01:03:05) until 5th July. BBC Worldwide and Starz announced today the production of an interactive app tied to Torchwood: Miracle Day. The app, titled Torchwood: Web of Lies, will feature 10, three-minute motion comic narratives providing clues to Torchwood: Miracle Day. The app and first motion comic narrative will be available for download on iTunes prior to the premiere of Torchwood: Miracle Day - produced by BBC Worldwide Productions, airing this summer in the UK on BBC One and in the U.S. on Starz. Additional narratives and games will be available for download following each week’s broadcast transmission. Torchwood: Web of Lies runs alongside weekly premieres of Torchwood: Miracle Day, providing fans with a way to engage in the world of Torchwood between episodes. It reveals a past day in the lives of Captain Jack Harkness and Gwen Cooper - a day they've both forgotten. The events of that day fuel a modern day conspiracy-laced treasure hunt, as Holly Mokri, voiced by Eliza Dushku (Dollhouse, Tru Calling, Buffy The Vampire Slayer), labours to uncover the secrets of Miracle Day. Each week a new episode unlocks, allowing players to access another piece of original motion comic narrative and game which ties into and extends plot developments of the show, as well as providing new twists in its own narrative. 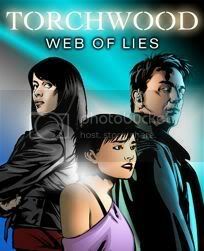 Developed by BBC Worldwide Productions and BBC Worldwide Digital Entertainment and Games, Torchwood: Web of Lies is written by Torchwood: Miracle Day writers Jane Espenson and Ryan Scott. The motion comic and app is published by BBC Worldwide, with Double Barrel (Tron: Legacy, Repo Men, Spartacus: Blood and Sand) producing the motion comic and Powerful Robot (Star Wars, Green Lantern, Scooby Doo, Total Drama) producing the app. BBC1 Controller Danny Cohen discusses what the BBC is all about, including the future of Doctor Who and Sherlock. are currently taking place in Manchester. Mark Gatiss chats about the new series of Sherlock, Doctor Who (confirming his episode title as Night Terrors), and the renewed popularity of fantasy on television. This is available to listen to worldwide via the BBC iplayer (from 1:05:40) until 25th June. This is available to listen to worldwide via the BBC iplayer after broadcast. Starz have issued a press release to announce the cast of Torchwood: Miracle Day are to appear at the San Diego Comic Con, taking place at the San Diego Convention Center, on 22nd July. For Immediate Release – STARZ will bring the casts of two of its most riveting original series, “Torchwood: Miracle Day” and “Spartacus: Vengeance” to 2011 San Diego Comic-Con on Friday, July 22nd, it was announced today. For “Torchwood: Miracle Day,” set to debut on STARZ, Friday, July 8th at 10pm ET/PT, the panel will feature: Torchwood alum John Barrowman (Capt. Jack Harkness), Eve Myles (Gwen Cooper), and new headliners Bill Pullman (Oswald Danes), Mekhi Phifer (Rex Matheson), Alexa Havins (Ester Drummand), Lauren Ambrose (Jilly Kitzinger) and writer Jane Espenson. Highlights of the “Spartacus: Vengeance” panel (slated to premiere on STARZ in 2012) will include fans’ first-ever opportunity to meet the new Spartacus, Liam McIntyre (Spartacus), along with stars Lucy Lawless (Lucretia), Dustin Clare (Gannicus), Manu Bennett (Crixus), Katrina Law (Mira) and Executive Producer and Head Writer Steven S. DeKnight. On Thursday, July 21 at 9:30pm PT, the eve of the panels, STARZ will screen a never-before-seen “Torchwood: Miracle Day” episode entitled “Night of Dead” in room 6DE. This episode premieres on STARZ the following day, Friday, July 22 at 10pm ET/PT. Imagine a day when nobody dies. All across the world, nobody dies. And then the next day, and the next, and the next, people keep aging. They get hurt and sick but they never die. This is the extraordinary premise of the highly-anticipated STARZ original drama series, “Torchwood: Miracle Day,” produced by BBC Worldwide Productions for STARZ, BBC Cymru Wales and BBC Worldwide. The new series, premiering on STARZ on July 8 at 10pm ET/PT, features Torchwood alumni John Barrowman, Eve Myles, and Kai Owen and new headliners, Mekhi Phifer, Alexa Havins and Bill Pullman. Special guest starring actors in the cult sensation include: Arlene Tur (“Crash,” Eat Pray Love) and Lauren Ambrose (“Six Feet Under,” The Other Woman). The 10-episode, hour-long series will also feature an impressive list of guest stars: Wayne Knight (“Seinfeld,” Jurassic Park), C. Thomas Howell (“Southland,” The Outsiders), Ernie Hudson (“OZ,” Ghostbusters), Nana Visitor (“Star Trek: Deep Space Nine”), John DeLancie (“Star Trek: The Next Generation”), Mare Winningham (Mildred Pierce, George Wallace) and Frances Fisher (Titanic, The Lincoln Lawyer). The show’s original creator, writer/producer Russell T Davies, serves as executive producer along with BBC Worldwide Productions’ SVP Julie Gardner, with Davies also serving as show-runner. “Torchwood: Miracle Day” is produced by BBC Worldwide Productions for Starz, BBC Cymru Wales and BBC Worldwide. From the time “Spartacus: Blood and Sand” debuted on Starz in January 2010, it established itself as an epic production with rich storytelling and visuals unlike anything seen previously on any TV show. Also starring John Hannah as Batiatus, Lucy Lawless as Lucretia, Peter Mensah as Doctore, Manu Bennett as Crixus and Viva Bianca as Ilythia, “Spartacus: Blood and Sand” was one of the most talked-about and best-loved TV shows of 2010. Season two of the series finds Spartacus and his fellow gladiators now out of Capua and engaged in the massive slave rebellion against Roman society that has echoed through time. “Spartacus: Gods of the Arena,” the six-part prequel that told the story of the House of Batiatus gladiator school, and the intricate personal, sexual and political maneuverings in Capua five years before “Blood and Sand” was set, debuted in January 2011. In season two of the popular series, Liam McIntyre takes over the role of the Thracian warrior sold into slavery in the Roman Republic city of Capua – where he rises to become the champion of the city – before leading the slave revolt that ended the first season. The part was played in the first season by acclaimed Andy Whitfield, who was forced to leave the show due to health issues. “Spartacus: Vengeance” recently began production in New Zealand. After all the fun of previous weekends, things were somewhat quieter this time, though the US, Canada and Australia finally caught up with A Good Man Goes To War. The winner of the Where's My TARDIS? competition was also announced at the weekend. Geeks of Doom(11th) - Matt Smith Returning In Series 7 Of ‘Doctor Who’; Plus Captain Jack and River Song Rumors! Minot Daily News(12th) - "Doctor Who"
io9(11th) - What do Doctor Who and The Dark Knight have in common? Hitfix(11th) - Review: 'Doctor Who' - 'A Good Man Goes to War': Are you my mommy? AV Club(11th) - "A Good Man Goes To War"
After Elton(14th) - Interview with Russell T. Davies: The "T" Is for "Television"
The Trades(11th) - DVD Review: Doctor Who, "Time and the Rani"
AV Club(12th) - "Tomb of the Cybermen"
Entertainment correspondent Colin Patterson speculates on what might be happening to Doctor Who over the next couple of years. This is available to listen to worldwide via the BBC iplayer (from 1:53:30) until 15th June. Actor Shane Rimmer discusses working on The Gunfighter and his experience with William Hartnell! This is available to listen to worldwide via the BBC iplayer (from 1:26:12) until 15th June. "Roy Skelton, the man who provided the voices for the Daleks and the children's TV characters George and Zippy. Elvis McGonagall pays homage in verse.."
This is available to listen to worldwide via the BBC iplayer (from 13:52). Bob Fischer talks to director Graeme Harper on his early acting career, directing Doctor Who, and Stanley Kubrick! This is available to listen to worldwide via the BBC iplayer (from 1:10:50) until 17th June. Richard from Norfolk provides an anecdote about Russell T Davies. This is available to listen to worldwide via the BBC iplayer (from 1:58:05) until 18th June. Media coverage/speculation continues apace over the future plans for Doctor Who. Meanwhile, new Torchwood clips with character videos and interviews with the cast keeps the interest in that series too. And sadly the voice of the Daleks, Roy Skelton, died on Wednesday. Gather(7th) - 'Doctor Who' renewed for season 7: Will Matt Smith return as The Doctor? BBC America(9th) - Will Captain Jack Harkness Revisit ‘Doctor Who’? Cultbox(8th) - 'Doctor Who': Which 'A Good Man Goes To War' guest character would you like to return? Cultbox(7th) - 'Doctor Who': What's still to come from the Series 6 trailers? Cultbox(6th) - 'Doctor Who': What did you think of 'A Good Man Goes To War'? Queerty(9th) - How Much Gay Will Make It Into Torchwood: Miracle Day? UGO(7th) - Torchwood Creator Spoils 'Miracle Day' Bombshell: What a Twist! This is Fake DIY(7th) - Torchwood: Could Captain Jack Be Killed Off? The Sun(8th) - David Tennant in Doctor Boo! TV Overmind(8th) - Former Doctor Who David Tennant "Minimized" In Fright Night? Hell No! Radio New Zealand(9th) - British actor and singer Roy Skelton, who provided the voice of the Daleks for television's Dr Who series, has died aged 79. Den of Geek(9th) - What is happening with Star Wars live-action series? After some insanerer media shenanigans the BBC have announced that Matt Smith will be staying in the role of the Doctor and that another 14 episodes are commissioned! Meanwhile, this current series saw the mid-series finale generating a fair bit of interest, whilst the US, Canada and Australia caught up with The Almost People. A new interactive experience pops up in the form of The Crash of the Elysium. And Much Ado reviews continue apace! Den of Geek(6th) - Was the Doctor Who mid-season finale a true game changer? Metro(4th) - Doctor Who: A good man goes to... where? Newsarama(6th) - Post Game TV Recap: DOCTOR WHO S6E6 "The Almost People"
Poptimal(6th) - Doctor Who Review: Epic Story, But Can We Get a Budget Raise for the CGI? Victoria Times Colonist(4th) - What'll it be: Dr. Who or Canucks game 2? io9(7th) - Yes! Matt Smith is officially back for another season of Doctor Who. All Media NY(7th) - Who Saves The Doctor? io9(6th) - What sort of hat would an evil Doctor wear? Matt Smith explains! TV Overmind(5th) - Doctor Who Slide-Show: Who's Your Favorite Companion? Sunday Mercury(5th) - Tyndale: Dr Who daleks are the worst baddies EVER! This is Fake DIY(4th) - Was Steven Moffat plotting Doctor Who's mid season finale sixteen years ago? Cultbox(3rd) - 'Doctor Who': Which episode of Series 6 is your favourite so far? Standard(6th) - Who's clothes does Daisy Lowe like best? Did the Mountain West Conference rip off 'Doctor Who' for its new logo? A.V. Club(5th) - "An Unearthly Child"
Blastr(3rd) - Stunning fan-made anime OWNS Doctor Who: Get the hint, BBC? Hydrapinion(6th) - So would Dr Who live in 5D?